born March 22, 1929 is a Japanese artist and writer. 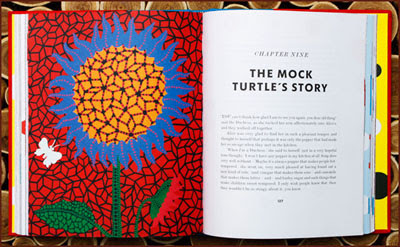 Throughout her career she has worked in a wide variety of mediums, including painting, collage, sculpture, performance art and environmental installations, most of which exhibit her thematic interest in psychadelic colors, repetition and pattern. 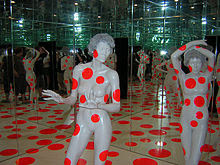 Kusama came to public attention after she organized a series of Body Festivals in which naked participants were painted with brightly colored polka dots. "... a polka-dot has the form of the sun, which is a symbol of the energy of the whole world and our living life, and also the form of the moon, which is calm. Polka dots are a way to infinity." On a chilly February morning, an 82- year-old Japanese woman is wheeled into the Tate Modern gallery in London, wearing a fringed red wig and a polka-dot dress matching the balloons hanging all around. She is the painter, peacenik and performance artist Yayoi Kusama, who made a splash in 1960s New York before heading home a decade later and then checking herself into the mental hospital where she still lives. Tate has opened a retrospective of her work, featuring polka dots, limp sculptures of the male organ and psychedelic rooms beamed with swirling colored spots. Famed avant-garde artist Yayoi Kusama unveiled her latest works, made of huge balloons, before they are displayed this weekend at an art festival in Tokyo's Roppongi district. 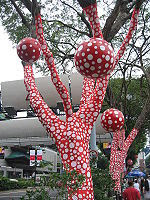 both decorated with her signature polka dots motif, will be shown at the Roppongi Hills complex during Roppongi Art Night on Saturday and Sunday. 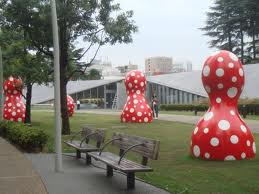 The arts fest also includes events at other area sites, including Tokyo Midtown and the National Art Center, Tokyo. 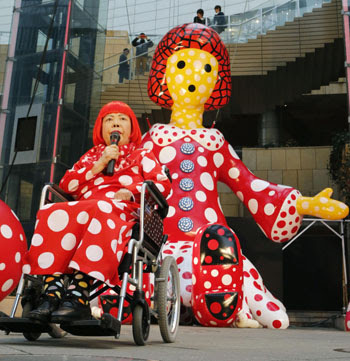 According to Kusama, "Yayoi-chan" embodies both her childhood and her current life, and symbolizes peace and hope. "Ring-Ring" is the pet dog of "Yayoi-chan." Kusama gave a speech in front of the two works Thursday, saying she has long believed in the power of love and art.